Joel Robinson and cosplayers at Star Wars Celebration. To Joel Robinson, it must have seemed like it was something that was happening a long time ago in a galaxy far, far away. 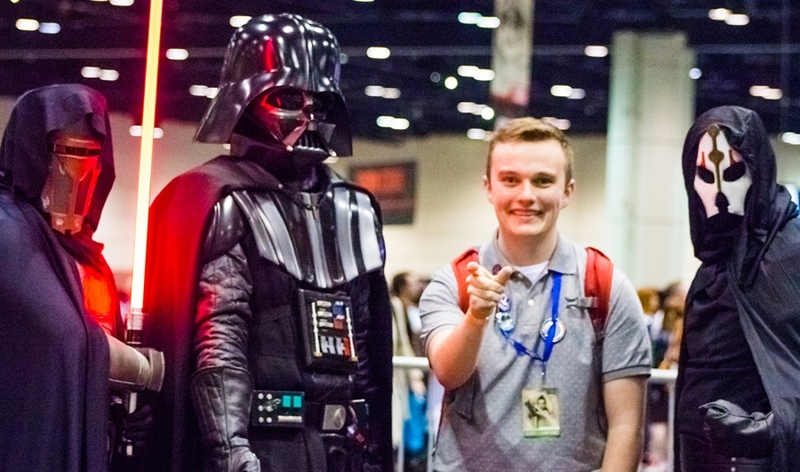 Robinson, a sophomore marketing student at the Sam M. Walton College of Business, was at the Star Wars Celebration — the Comic-Con of Stars Wars — in Orlando, surrounded by his heroes who had created, and continue to create, the films, books and other media in the Star Wars movie franchise. In addition to going to college and working as a part of the video team at UA Productions, the Division of Student Affairs' multimedia student-led communications group, Robinson hosts the Rogue Squadcast, a fan-hosted podcast that discusses movies, books, comics and television — really anything and everything Star Wars. "Going to Star Wars Celebration had always been a far-off dream of mine," Robinson said after returning from the convention in April. "Before this event, I had never been to any type of convention. Honestly, I almost didn't apply out of fear that I wasn't ready and that it was impossible that my podcast would be selected out of all of the hundreds of other podcasts on the internet." "I told my Walton College adviser Jeff Hood that I was thinking about applying," Robinson said. "He encouraged the idea and helped me realize that this was an opportunity that I couldn't afford to miss." There was an extensive application for applying to have a panel at the convention. Applicants had to show that they had an audience of fans regularly watching their podcast and that he and his fellow panelists represented the values of Lucasfilm. At only 20 years old, Robinson is one of the youngest members of the Rogue Squadcast, which uniquely positions them to give the viewpoint of the young adult demographic. He believes what makes the Rogue Squadcast different from many of the other podcasts is the youth of their panel and the depth of knowledge they have specifically for the new movies and media. At the event, Robinson spent most of his time observing the video team from Lucasfilm at the Star Wars Show Live. "They are all so talented and there was so much to learn by just watching their process," he said. For all four days, Lucasfilm had their entire social media team working the show, filming video segments, and interviewing celebrities of all which were streamed live to YouTube. Between live segments, Robinson was able to have a short conversation with Andi Guiterrez, Lucasfilm's digital communication's manager. Guiterrez told Joel that she watches his videos and they are really good. "Which to hear from her, the person who has my dream job, means the world to me," he said. Robinson began doing his podcast as an experiment during his senior year of high school. He began making Star Wars related videos for YouTube and when he had success with that, he looked for other ways to create more content. A fellow YouTuber told him about podcasting. "I had never experimented with a live show before, so podcasting was a totally new format of video for me," he said. "It was super hard at first because with pre-recorded video I have total control and always can edit, reform and rethink. With doing a live podcast you have to plan but also be flexible and ready to adapt to the audience's reactions and to the actions of the other members of the podcast." To get a taste of what he means, visit Robinson's website at TheJoelRobinson.com.